Hindsight does have a remarkable way of allowing the past to be revisited and properly understood. There are many events leading up the the US-sponsored and CIA-coordinated coup d’état in the Ukraine which point directly to a highly covert implementation plan going back to 2007. 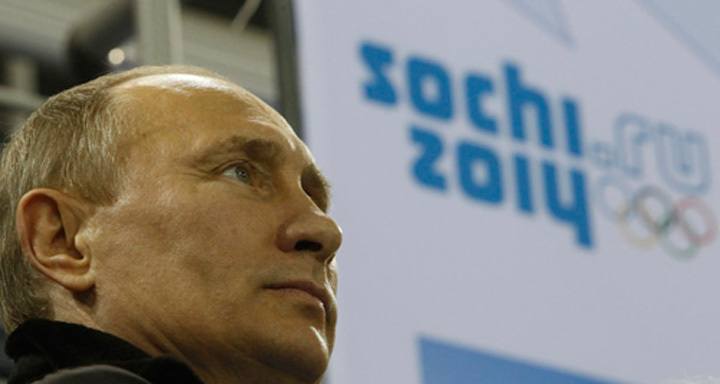 That was the year that the 2014 Winter Olympics was officially awarded to Russia. Sochi is the southernmost city ever to hold a Winter Olympic Games. All the competition venues were located within relatively close proximity to the Olympic Village located in Olympic Park in Sochi. Which begs the question: How does a city nestled on the subtropical Causasian Riviera get awarded the WINTER Olympic Games, except by design? The actual approval occurred in 2007 — a year when global warming was rapidly picking up steam. The inherent risks of placing a Winter Olympics in such a questionable geographic location are beyond ludicrous, especially in light of the costs associated with hosting these exorbitantly expensive extravaganzas. Here are some headlines, which appeared during the past Olympics, that illustrate this point much better than we can. Why Is It So Warm in Sochi Right Now? 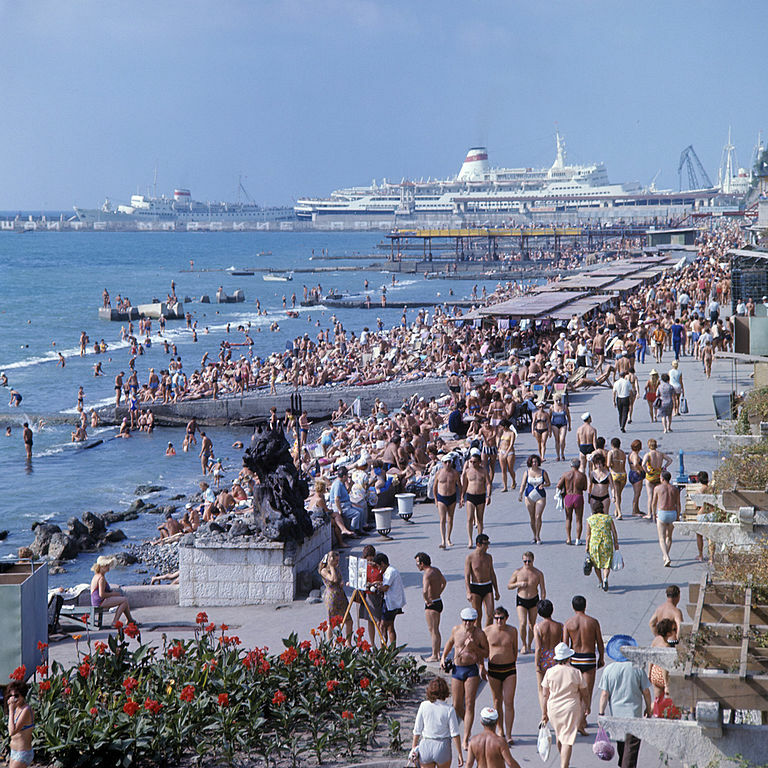 Sochi beaches are known as the Caucasian Riviera. There’s no good reason for Sochi to have been chosen for a Winter Olympics, except for an opportunity to stage a full blown revolution in downtown Kiev. Yes, that’s just how the planners at Langley think. Years ahead in their design and engineering of coups, wherever they choose to overthrow a legitimate government. What is particularly noteworthy is the unusually close proximity of Sochi to Kiev. Vladimir Putin probably never thought the CIA and Company would have the audacity to perpetrate such a transparent coup d’état during the actual Olympics, which is exactly what the Anglo-American / European Union / NATO conspirators did. Actually, knowing Putin, he probably now puts nothing — absolutely nothing — past the Anglo-American Axis. They have proven repeatedly that they will do anything they want, anywhere, anytime. Therefore, it is quite likely that Putin must have seen it coming all along, knowing that there was really nothing he could do to stop it. The Ukrainian President’s behavior throughout stands as testimony to such a forgone conclusion. That he even escaped so easily to Russia probably surprised the CIA plotters who were probably hellbent on pulling a Romanov family-style execution. They are hunting down Viktor Yanukovych’ s son with a vengeance at this very moment. Before, during and after Sochi, Putin was playing a serious game of chess while his Western counterparts were playing checkers. Putin is rightfully known as a very savvy and skilled geopolitical chess player. Surely he knew that he could parlay such a foolhardy and reckless scheme implemented in Kiev into a checkmate … a checkmate in Crimea. Really, can Washington be SO stupid as to have provided a perfect and totally reasonable pretext for Russia to take back the prize known as The Crimea Peninsula?! Those guys in DC, London, Brussels, and Tel Aviv must be on way too much blood pressure medication, as a result of all the other mismanaged coups they have conducted around the world since 9/11. Truly, one gets dizzy thinking about how many revolutions, civil wars, coup d’états, protests, armed conflicts, border skirmishes , etc. these folks initiate to bring down democratically elected leaders. This is their stated way of exporting freedom and democracy worldwide. Even nations that are peaceful and prosperous are quite vulnerable to the CIA machinations, if they happen to be located in the wrong place, and at the wrong time. Back to the Sochi Olympics, it does appear that Obama was placed in office by the very same people who have called for the isolation of Russia, and the taking of the ex-Soviet republics bordering the motherland. Zbigniew Brzezinski (United States National Security Advisor to President Jimmy Carter), George Soros and others advising Obama on critical foreign policy during the 2008 presidential election campaign were determined to get Obama to voice his intention to isolate Russia and drone away in Pakistan, which is exactly what he has done. Therefore, there are no surprises here; only complete and total mortification that an ill-advised plot to award an Olympics to Russia would be cynically exploited to overthrow a functioning democracy. Particularly one in such a volatile region contiguous to Eastern Russia, known to be inhabited by a fierce and powerful BEAR. All the while, as Putin was sunning in Sochi soaking up the limelight for having averted World War III in Syria, the Western ruling elite was perpetrating the Ukraine Revolution 2.0 in his back yard. Little did they know that they would lose not only Crimea, but also the much more economically productive Eastern and Southern Ukraine in the process. These guys are just too funny. Particularly in view of the distinct possibility that much of Europe may even be without heat in the coming winter, should the Ukraine persist in refusing to pay its gas bill. We suppose that the USA forgot to think about that … but then maybe they didn’t … when they voted to award Russia with the Winter Olympics of 2014! After all, there is a big pond between CIA headquarters in Langley, Virginia and Maidan Square in Kiev, Ukraine. Can there be any doubt that Sochi was put on the drawing board by the CIA as a means of further encroaching on Russian sovereignty? Why is it that the Anglo-American Axis has it in for Russia, for so long?! There are actually several reasons which will be discussed in our next installment in this ongoing series about the Ukraine. In the meantime it is advisable to closely watch every move that is made — by both East and West — on the game board known as Maidan Nezalezhnosti (literally Independence Square). Since this is where the Great Game is being played out for the foreseeable future, much more is at stake than can be imagined. Whoever wins this ‘game’, will exert more influence the world over for decades to come. Given the multitude of forces at work, most of them unseen and unheard, many of the most consequential moves will occur far from the Ukraine. Nevertheless, the outcomes are guaranteed to be are as weighty and as far-reaching as they have ever been. The author wishes to thank Richard for his penetrating insights which formed the basis of this article. His prescient analysis of world affairs and profound understanding of geopolitical events are quite present in this reassessment of the US-triggered, CIA-run coup in the Ukraine. Caucasian Riviera is known to have subtropical weather. 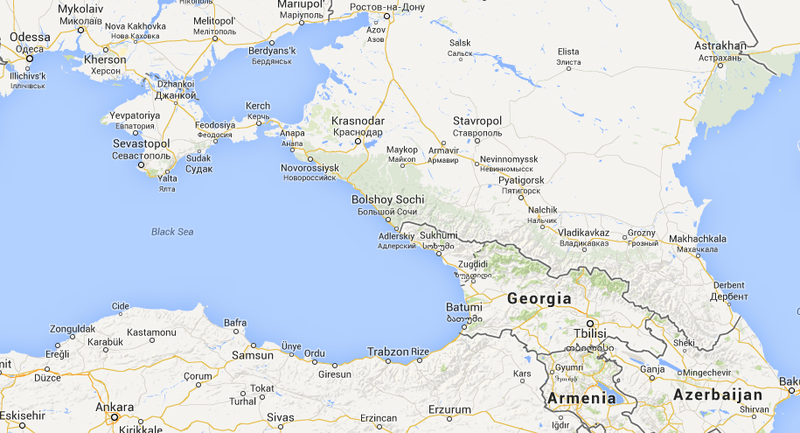 Google Map of Sochi on the Black Sea coastline.